We are in the throes of Summer Break over here. Sleeping in, endless screen time, eating cereal out of the box, ice cream for lunch… we’re living the dream, man. Or, at least we were. And then the first week of break ended. The novelty of it all wore off, apparently, and my kids suddenly realized that they were BORED. They started whining, pulling at my pajama bottoms, and begging me to play with them or take them to the park. Now, I love my kids, but I work from home part-time. That’s a polite way of saying that breaks from school make it damn near impossible for me to get anything accomplished, which translates into a lot of very late nights and early mornings of me frantically working to meet deadlines. During the summer, I stumble around in lounge wear during the day, gripping a coffee mug like it’s my lifeline. Which it totally is. 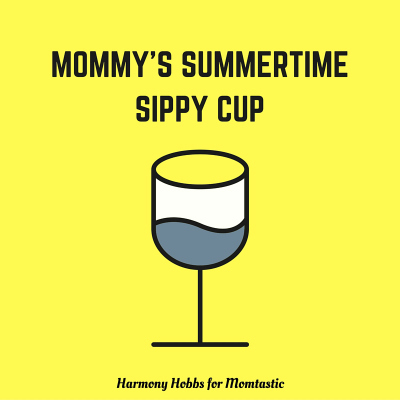 In order to cope with the stress of balancing being a full-time mom and trying to keep up with my other responsibilities, I’ve developed a few Summer Break survival tips that I plan to use all summer long. We bought a membership to a warehouse club because I’ve made it my personal mission to never, ever run out of coffee. I’m serious. 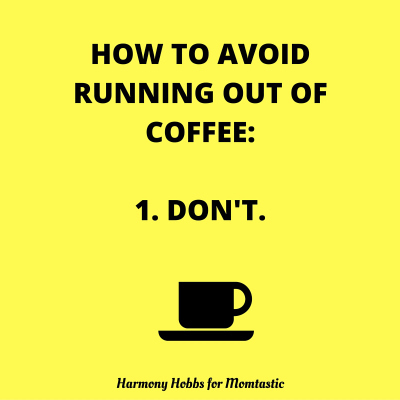 My husband was dubious at first, but when he saw me collapse into to tears one morning upon realizing we were out of coffee and I was going to have to load our three kids into the van and either go to the grocery store or the nearest Starbucks, he realized the depth of my addiction. P.S. I have no business driving anyone anywhere without caffeinating first. Whatever standards I had once upon a time for healthy living, a clean home, nitrate-free hot dogs, and organic dairy have been stomped down. Flattened beyond recognition, people. 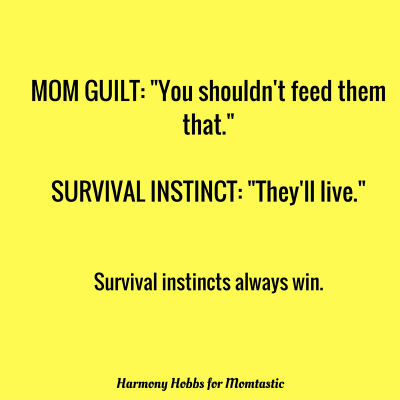 I’ve become one of those moms who live by the motto “Eh, they’ll be fine.” I can’t just blame the kids for my plummeting standards; I am simply too tired to exert any additional effort. So … chicken nuggets and Pop-Tarts it is. 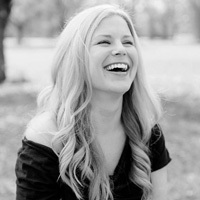 Eleanor Roosevelt famously said, “Do one thing every day that scares you.” You know what scares the bejeezus out of me? 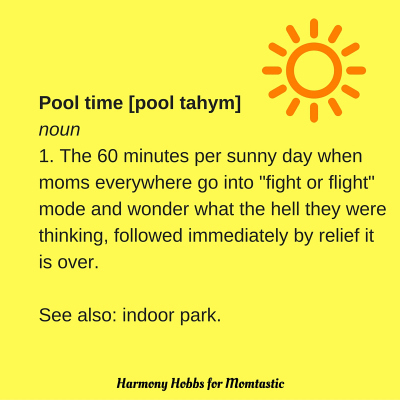 Public swimming pools. But we go anyway, because Eleanor Roosevelt was a really smart lady, and also because swimming wears my kids OUT. An hour of my life spent at the local pool, fearing that one of my children will drown or ingest a rare form of bacteria, ends up being well worth it after we get home and they are actually quiet. Relaxing the rules of everything from bedtime to screen time, has made the days go easier for me. Yes, the kids may be rotting their brains and forgetting everything they’ve learned, but everyone (including me!) is so much more relaxed! And relaxed kids and moms are happy kids and moms. At least, until they aren’t. And for that, we have wine. 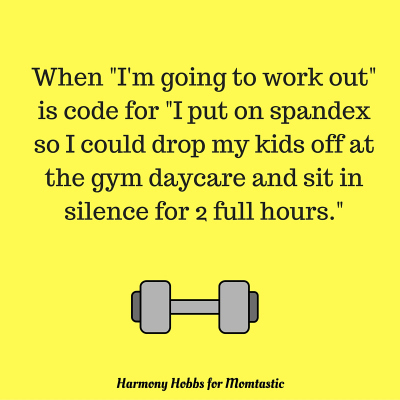 I go to the gym as often as possible … because the gym has free childcare. I mean, it’s not exactly “free.” I do pay for it. But the important thing is, for two hours per day, I can walk on a treadmill in peace or sit in silence and stare at a wall without anyone bothering me. The kids have fun and I can regroup. It’s a total win/win. Here’s the thing: There is no escaping summer. It’s going to happen, it’s going to be crazy, and no amount of planning can save you. 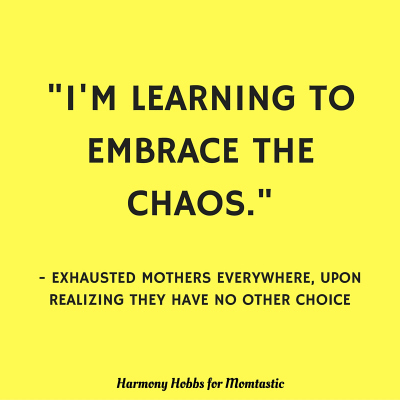 Some seasons are a more controlled version of chaos than others, but the fact remains that our best course as mothers is to try our best to embrace it. After all, it’s a season, and as we all know, all seasons eventually come to an end.